French athlete Larby Sraidi took the men's race clocking 2:20:58 and Moroccan Khedija Laaribi won the women's marathon in 2:56:09 at the second edition of the Le Marathon International des Oliviers de Sfax. The half marathon titles were retained by Moroccans with Taoufik Allem in 1:04:14 and her compatriot Ben Fethia Chatki in 1:17:25. Nearly 170 athletes representing fifteen countries took part in two competitions organized on Sunday December 15 in the forest of olive trees Menzel Chaker, 40km from the city of Sfax. Both competitions were held on the sidelines of the 2nd international exhibition of olive held on 14 and 15 December to promote the southern capital as sporting , tourist and cultural destination. Athletes representing Algeria, Morocco , Libya, Tunisia , Spain, Italy , France , Poland, Romania , USA , South Africa , Kenya, Ethiopia and Panama took part in this year's Sfax Marathon des Oliviers which attracted record entries. Sfax hosted four races Saturday for amateurs, including a fun run with traditional clothes required, (Djebalh for men and women Safsari for women) which were attended by 400 athletes . In addition to these events, a "marathon village" was set up including the heads of several associations providing free medical services (ophthalmology, diabetes, fight against doping) at the Bab Bhar city centre and Ksar El Hana Menzel Chaker . 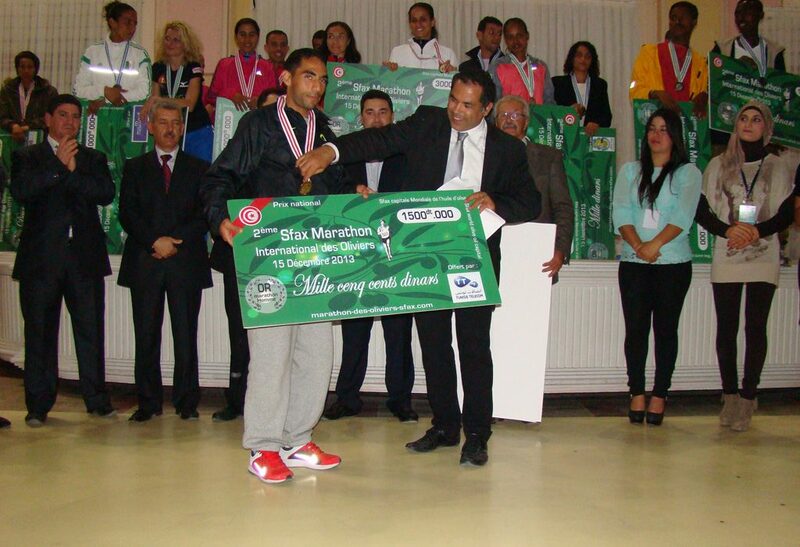 According to the director of the competition, Sfax Marathon olives obtained the international certification of the IAAF-AIMS for two marathons and half marathon races which is valid until 2017, which will allow it to be recognized as such by the International Association of Athletics Federations (IAAF) and on the agenda of marathons in the world. "The international marathon olive helped promote tourism , cultural and sporting image of the city and strengthened his candidacy to host the 2021 Mediterranean Games ," said for his part, Mabrouk Ksantini , chairman of the special delegation of Sfax.